I would be a valuable member of society if I was given the chance. These are just two messages Syrian refugees interviewed for the 'Building Futures' survey, carried out by the University of Glasgow, had for their host communities. 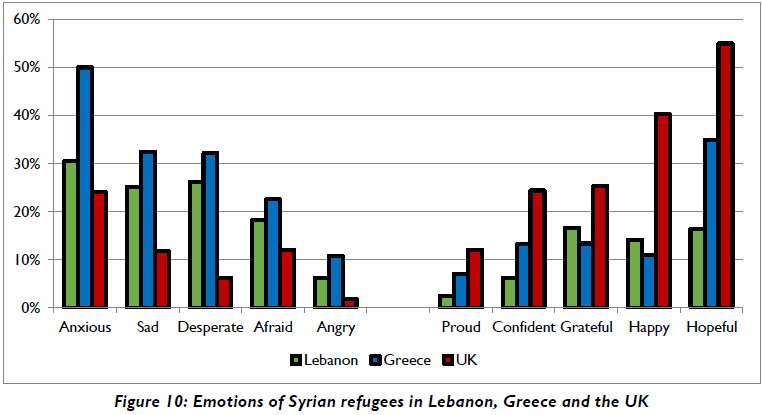 Lebanon, Greece or the United Kingdom – when asked how content Syrian refugees living in these countries were, their answers varied sharply depending on where they were. Syrians in the UK appear to be happiest – they came in first place for all the positive feelings, like pride, confidence, gratefulness, happiness, and hope. Greece, on the other hand, topped the charts, with Lebanon not far behind, for the negative feelings like anxiety, sadness, desperation, fear and anger. The differences may have something to do with the different educational levels of the Syrian respondents in each country, and perhaps also the state of the economy and provision of social welfare in each location, as a new study suggests. The University of Glasgow, for their survey 'Building Futures', spoke to 1,516 Syrians in Greece, Lebanon and the UK between April and October 2017 about their experiences, their aspirations and skills. All respondents were between the ages of 18 and 32, all of whom are international protection beneficiaries or applicants. The study’s aim was to promote consensus and cross-community understanding "in a context of strained public resources and anti-immigration sentiment." 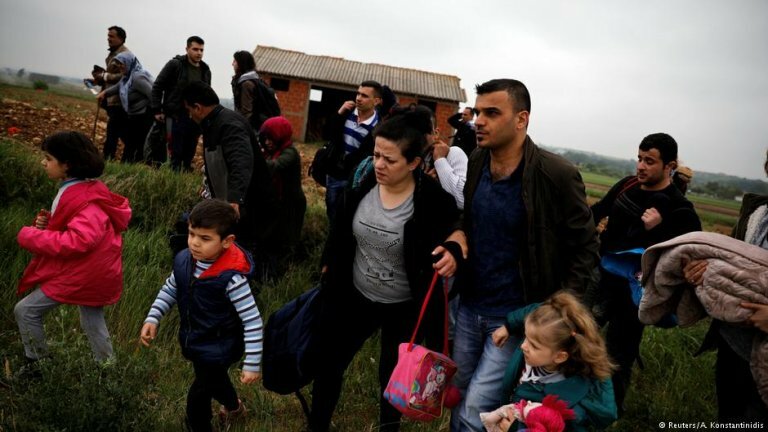 Aside from comparing refugees in the three countries, the study further differentiated between refugees who arrived in the UK using their own means (the so-called 'Asylum Route' - AR), and those who had been resettled under programs in the UK (the so-called 'Resettlement Route' -RR). In fact, there were great differences between the feelings of Syrians who had arrived via the RR route and those who had arrived with their own means, hoping to seek asylum, AR. Maybe because of their vulnerability and sometimes lower educational levels, the RR Syrians had a lower employment rate than those who had arrived and immediately had to fend for themselves to survive. "[The asylum route AR] forces [people] to become more integrated in the labor market, but this doesn’t mean that they are better integrated into society as a whole," explains Dr Dimitris Skleparis, a researcher in the School of Social and Political Sciences at the University of Glasgow, and one of the co-authors of the study. On the other hand, RR Syrians in the UK were happiest with the authorities, their welcome and the support they had received even though they took longer to enter the job market, partly because they spent longer on language courses. 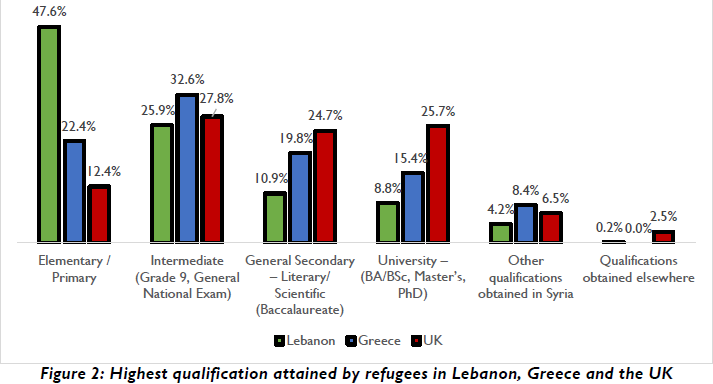 The researchers found that those in Lebanon tended to have the lowest educational levels (on average) and those in the UK the highest. Although unemployment was higher for the Syrian population than for the host communities, more people were employed in the UK too than anywhere else. Unfortunately, the study found, that those people tended not to be utilizing their skills and were often employed in lower skilled jobs than their education levels and previous qualifications would suggest. Again, this might have something to do with the economies of the countries and the fact that those in Greece mostly did not want to stop there but had hoped to make it to the UK or other northern European countries but had been stopped either because of borders being closed or because they ran out of the means to get further. Despite the many variations, Syrians in all three host countries cited language as the main block to their integration and access to the job market. Not understanding the local way of doing things and a lack of contacts was also a problem. Some people in all three countries reported some levels of hostility from the host population or a lack of understanding about the situation of Syrian refugees in general. 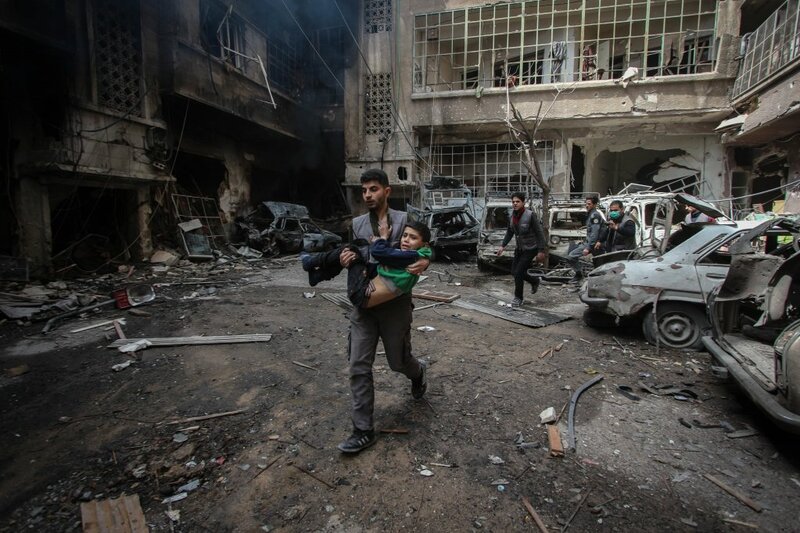 The most hostility was suffered by Syrians who had fled to Lebanon. They were also, perhaps not surprisingly, the group of people who most wanted to return to Syria when the war was over. Skleparis clarifies that although both Syrians and Lebanese speak Arabic, they have very different accents, despite their geographical proximity. "Along with the problem of misunderstanding, the other thing is all the labels that their accent brings with it, [in Lebanon]." There were also similarities between Syrians and their host communities, even more than perhaps either side might at first imagine, said Skleparis. 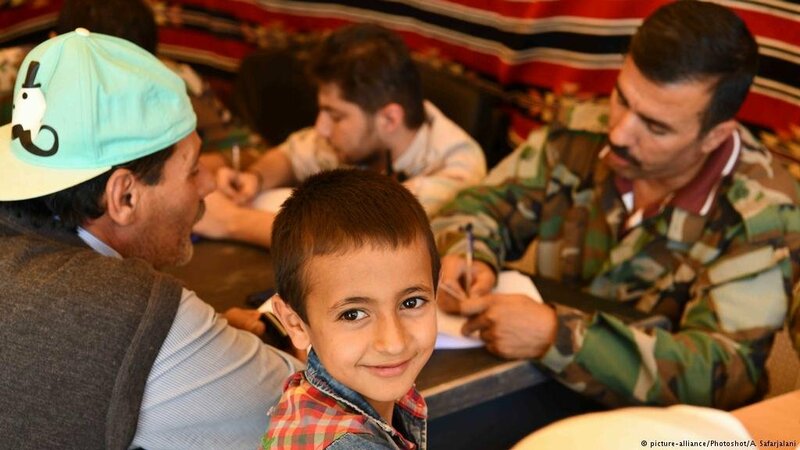 Part two of their study, which should be published in summer 2019, will look at what 3,000 members of the host communities in Greece, Lebanon and the UK think of Syrian refugees. Skleparis has some results back already. He found that for Syrians and UK born citizens the same three ingredients made up a "good life", only in slightly different orders. For British citizens, family, health/bodily integrity and then education were the most important and for Syrians, health/bodily integrity, family and then work were keys to a good future. "The different order in the first and second position makes perfect sense," says Skleparis. "Refugees have fled a war-zone and have first-hand experience of the importance of [health and] bodily integrity. The choice of 'work' as the third most important component potentially shows the aspiration to be financially independent and feel useful." "I am human just like you, treat me with respect and give me the opportunity to rebuild my life." The study has made recommendations for policy makers with the aim of improving integration across the board. Although there are already differences between AR and RR people, Skleparis thinks that policy makers need to provide more support across the board. He admits that there has been reluctance to do that because it presumably says tacitly to AR people 'OK you can arrive by illegal means but you will still get support.' That’s where the policy should be changed, thinks Skleparis. If those who have stronger skills were given the boost of language courses and integration into a corresponding job, they would actually be more beneficial to their host society overall. They are also advising governments to stop setting refugees apart and start treating them more inclusively overall. “They are here, they are part of society, so there is no reason why we should talk about vulnerability in terms of being a refugee. We should talk about vulnerability in general because it affects both host populations and refugee populations," explains Skleparis.